Observation - Girdled Snail - UK and Ireland. Description: Small snails (abuot 1cm) with tight whorls,dark and cream brown colour. Found in leaf litter in garden.Any ideas? 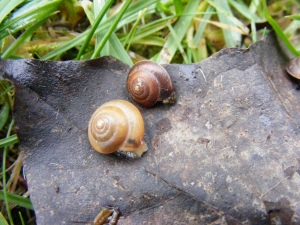 Small snails (abuot 1cm) with tight whorls,dark and cream brown colour. Found in leaf litter in garden.Any ideas?